"This world, this world is a gift which life gave us"
The German Final was held on February 27th at TV Studios in Frankfurt, hosted by Günther Shramm. 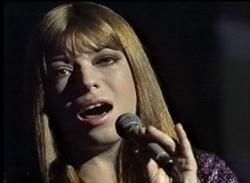 All of the songs were performed by Katja Ebstein and the winner was chosen by a jury of 10 people. Katja Ebstein previously represented Germany in 1970. At the ESC she came 3rd.